James was primarily involved during July - December 1997 and March 1998 with the construction of "Bootiful" for the Unlimited Speed Sailing Co. Ltd. and its attempt at the record, creating formers or bucks for the shape of the crafts large sections, then applying many layers of pre impregnated carbon fiber in very specific patterns to maximize the structural strength of the material and the shape which were vacuumed together and backed at several stages of the layering process. These sections (the longest of which was 22m long) would be joined together to make finished components or the smaller sections could then be assembled into lager components. The sport of Speed Sailing is quite simply the pinnacle of yachting achievement. Speed Sailing boats are the fastest and the most spectacular wind powered craft on water. The World speed sailing record is the nautical equivalent of the land speed record. Timed over a 500m course close to the shore, to get the flattest water surface possible. After 20 years as a top boat designer and professional windsurfer, Simon Sanderson decided to make an assault on the World Speeds Sailing Record by designing a radical new super boat. 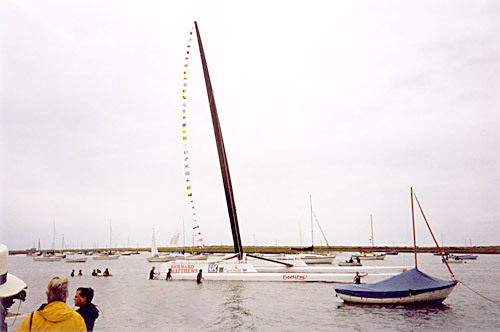 Simon tested the concept with a 20ft prototype that won the Weymouth Speed Sailing Championships and caused a sensation at the Southampton Boat Show. With proof to back up the concept, Simon and fellow crewman and business partner Tom Marriott created The Unlimited Speed Sailing Co. Ltd., with headquarters in Norfolk. They secured the backing of Bernard Mathews to build a 60ft (18.2m) long, 72ft (22m) high, state of the art catamaran called “Bootiful” to brake the record. The team’s main aim was to break the World Speed Sailing Record (then held by the Australian Yellow Pages at 46 knots (53 mph) and set a new bench mark in Yachting performance of over 50 knots (60 mph). "Bootiful" is the carbon fibre brainchild of all Simon’s experiences, chiefly his genius at designing windsurfers. His abilities have earned him numerous records. 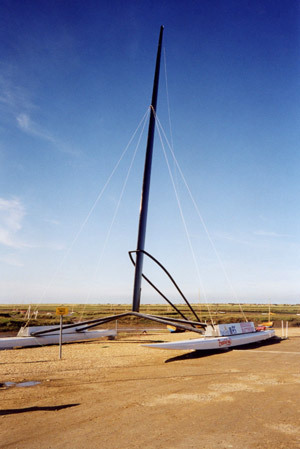 In 1988 Simon Sanderson designed and shaped the windsurfing board that enabled Eric Beale to beat more than 40 knots and hold the record for 2 years. "Bootiful" used proven windsurfing technology. 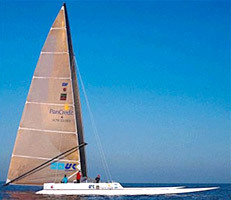 Despite her 60ft length she weighs 750kg, 90 percent less than a conventional racing catamaran of the same size. Her two flat bottomed hulls will skim the surface of the water like a windsurf boards, while another radical aspect of the design is the absence of rudders, to cut as much weight and water resistance as possible. Simon and his two crew will steer by moving the hulls relative to each other, along the tracks on the x-shaped crossbeam (which supports the mast) this will enable the crew to steer, using a pedal power winch system. As the boat speeds up, it lifts out of the water until it is skating along the surface on the very back end of each hull, were long fins prevent it moving sideways. The launching ceremony a media event which was held in Brancaster Staithe, North Norfolk was performed by Lady Mary Colman, accompanied by her husband Sir Timothy Colman (who broke and held the World Speed Sailing Record from 1972 till 1986 breaking the record seven times during this period with Crossbow 1 and 2) and Wing Commander Andy Green the current World Land Speed Record holder. Despite this fantastic start and the initial trials producing promising results they sadly were unable to continue due to lack of funding.